Spring has truly sprung here on the Gold Coast, and we are sure the rest of Australia isn’t too far behind. It’s time to get outdoors, get active with the family and get the yard ready for summer BBQ’s! 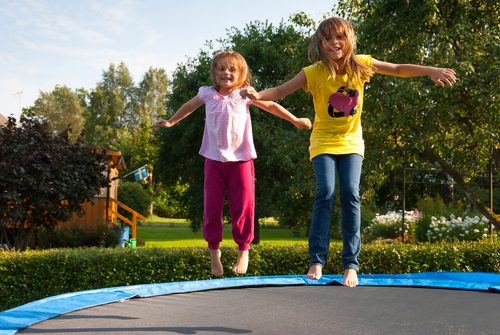 We love our in-ground trampolines – perfect for those that have the space, they keep the yard tidy! Not to worry if you can’t get an in-ground trampoline happening at your place – we have a huge range of trampolines to choose from that will satisfy even the bounciest of kids! Our favorite and most functional for kids that love to bounce is our rectangular yellow mat trampolines! The Olympic Standard and the Pro Jumbo trampolines are durable, long lasting and come under warranty – not to mention, proudly Australian Made and Owned! For all trampolines that are on the Christmas wishlist, we ask that lay-by be during September. For on-time Christmas delivery, we must dispatch by November 20th for all interstate deliveries. No matter where you are in Australia, we’ll get your trampoline to you! Contact our friendly team today and order your new topline trampoline.